The Super Smash Bros. franchise has been a hit since its inception on the Nintendo 64. With each entry into the series increasing the popularity of the franchise. Whether it be bringing old fans back or creating new ones, Super Smash Bros. for Wii U is no exception. With 49 playable fighters, Super Smash Bros. for Wii U has the largest roster of characters ever in the series. 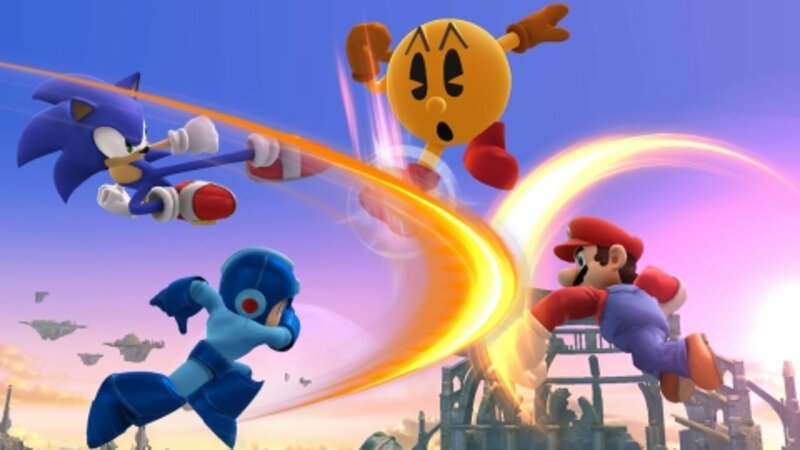 Mario, Sonic, Mega Man, and Pac-Man battling it out in SSB for Wii U. The core fighting elements of the game feel fresh and new for the series while remaining familiar. For very experienced players of past games, you might notice quite a few changes. First, many of the advanced techniques used in Melee and Brawl will not be found. This might not apply to everyone, but if you are coming from Brawl or Melee expecting to have a similar experience for advanced play, you may find yourself disappointed if you don’t want to adjust drastically. However, if you have only ever played previous titles in the series casually with friends, family, or alone, you will feel right at home with this entry. Masahiro Sakurai, the game’s director, has stated multiple times that he views the Super Smash Bros. series as a party game not designed to be taken to the competitive tournament level. This leads to some frustration with competitive fans of the series, who play it competitively anyway. 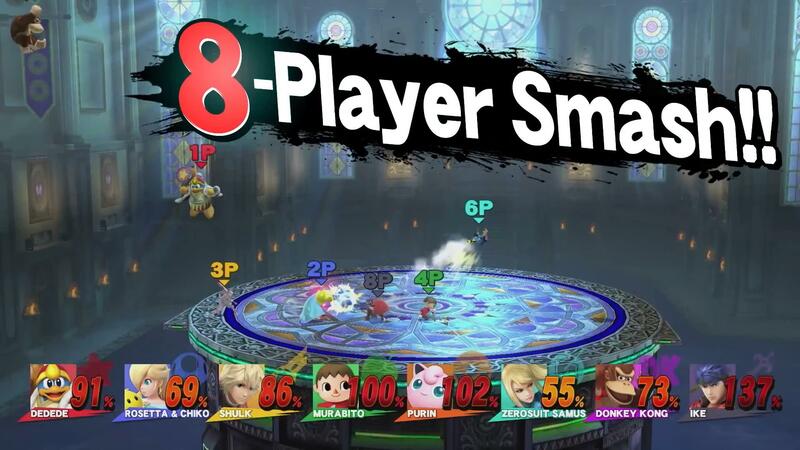 8-Player Smash announcement featured in the Super Smash Bros. 50 Fact Extravaganza. One of the defining modes of this latest installment is 8-Player Smash, which is a local mode in the game where, you guessed it, you can play with up to eight players on one Wii U console. While this mode is limited to specific stages, there are stages that are specifically built for this mode as well, such as Palutena’s Temple. Don’t worry, though, these stages aren’t limited to 8-Player Smash. Another mode that makes this game unique is Smash Tour, which is a very complicated mode to describe to someone who has never played it. It is comparable to Mario Party in its layout, with smash battles instead of mini-games. It is complete with three different boards to play on, a small, medium, and large board. The modes most people are probably going to play are either For Glory or For Fun. These are online modes featured in the With Anyone mode where you can fight with other Wii U players around the globe. Please note that stages built for 8-Player smash are not an option for any With Anyone mode. For Glory’s features include matches that only utilize omega stages with items turned off. For Fun’s features non-omega stages with items turned on. For Fun, features two modes, the first being Smash, 4 player free-for-all timed match and the second being Team Smash, a 2-on-2 timed match. 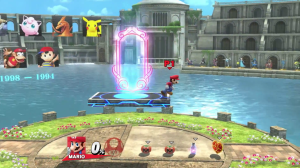 For Glory has three separate modes, the first also being Smash, a four player free-for-all, timed match, the second once again being Team Smash, a 2-on-2 timed match, and third being 1-on-1, a 1-on-1 timed, 2 stock match. If you want to play online with your friends, the With Friends mode allows the host to customize and change any rules the host desires. Voice chat is a feature exclusive to the With Friends mode. It is an optional feature that applied at all times except for the actual match. This is due to making sure the connection is as strong as possible while smashing. Some modes that are not included in the game are an Adventure mode or Subspace Emissary equivalent story-based mode. This has left many fans disappointed, and although I wasn’t the biggest fan of Subspace Emissary, the Adventure mode from Super Smash Bros. Melee is one of my favorite modes in that game and I would have loved to have seen it return, sadly, that is not the case. Classic mode has been completely redesigned. Instead of picking a set of 5 difficulties and riding a set path of enemies as seen in previous installments, you bet coins to increase your difficulty near identical to the difficulty meter found in Kid Icarus: Uprising and choose from a set of different enemies to fight. A returning mode that is near identical to previous installments is All-Star mode, however, this time, you do not have to have all the fighters unlocked to access the mode, instead, it excludes any fighter you have not unlocked. The game’s soundtrack is massive, with music relating to each of the fighters and stages as well as the franchises they represent. There are countless original works as well as remixes of tracks as well with my personal favorite being Mechanical Rhythm from Xenoblade Chronicles. The game is even equipped with a music player in which you can listen to your favorite tracks. There are also a plethora of stages to play on, however, if you are expecting tons of new stages, don’t get your hopes up. Most of the stages in this game are from Brawl, Melee, as well as even the original given an HD overhaul. However, that is not to say there are no new stages, stages like Jungle Hijinx, Yoshi’s Woolly World, Wily’s Castle, Windy Hill Zone, as well as others are fresh and new. The game also has a stage creation mode. Using the GamePad, you can draw platforms, add lava, cannons, moving platforms as well as other tools. You can also choose a variety of backgrounds as well as have the game’s entire soundtrack at your disposal. Super Smash Bros. for Wii U is a great game worth all of the praise it gets. Despite the few problems with advanced, competitive play, it hasn’t stopped advance players from picking it up and hosting competitive tourneys. It is extremely easy to learn and play with friends and family whether it be locally or over the internet. With its massive roster of characters and stages, Super Smash Bros. for Wii U is enjoyable for all types of fans. Disclaimer: This review covers the base game. Updates and DLC that have been added to the game are not covered in this review.